Frigidaire FAFS4272LN Affinity Classic Front Load Washer 4.2 Cu. Ft. Featuring a modern and elegant design and equipped with cleaning features that make washing almost effortless, this Frigidaire FAFS4272LN front load washer is great to have in your laundry room. Since it comes with the highly useful Energy Saver option, you can get up to 60 percent in energy savings. 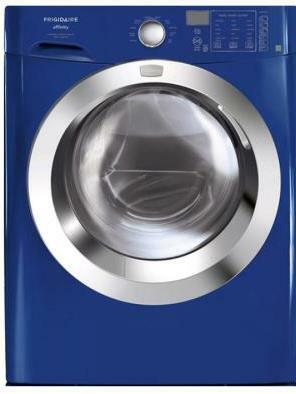 This washer delivers a quiet and vibration free operation moreover, even when when washing huge loads. Easy to install and space saving, installing this washer even on the second floor is never a problem. The Ready Steam Option delivers clean clothes out of the washer and removes stains thoroughly. Noise is managed effectively through the SilentDesign option and the Vibration Control System ensures vibration free washing operations at all times. The TimeWise feature makes drying time as easy as washing, since washing time corresponds to that of drying time. To make sure that your laundry is free from bacteria after each washing, this washer has earned an NSF certification. It is also more energy efficient than other washers since it can reduce energy consumption by as much as 60 percent. The WashSense Technology feature makes sure that clothes are cleaned thoroughly while maintaining the best care possible. Adding an extra garment while the cycle is going on is also possible, with just a few button touches. You can also save your settings in advance so using your washer is easy during the succeeding laundry operations. The Multiple Cycles Option allows you to choose the right washing cycle, according to specific loads, and the Delay Start option allows you to program your laundry ahead of time for your utmost convenience. This front load washer is available in various exterior styling, from Classic Blue to Classic White andeven in Classic Red. High standard craftsmanship is evidenced by its Stainless Steel Drum and Control Lock feature. The Express Select Controls make washing more convenient, as you can easily opt for the washing cycles you require during every load. Secure your laundry during each washing cycle with the Stay Fresh Door Seal and Stay Put Door. Remove even the toughest stains easily with the Ready Steam option of this front load washer. Stop worrying about vibrations especially when washing oversized loads. The Vibration Control System keeps the washer well balanced so you don't get unnecessary noise and vibration. Have your clothes cleaned and well cared for with its WashSense Technology. Choose from seven different wash cycles, including the Whitest White cycle and Deep Clean Sanitize cycle. Program this washer ahead of time, so you can wash on schedule or whenever most convenient. This washer does not have extra cycles, although the basic cycles are great for average use. This Frigidaire model does not have a CEE Tier 3 qualification, which is the highest rating in efficiency that any washer could obtain. Front load washers are more expensive to use compared to most traditional washers.